By the time Donald Trump is charged, tried, and sentenced for the literally hundreds of felonies he’s committed, he’s going to end up in prison for the rest of his life – and his felony of kidnapping immigrant kids and locking them in cages will probably fail to get the headlines it should. That’s why it’s so fundamentally important that Homeland Security Director Kirstjen Nielsen go to prison for putting kids in cages. Kirstjen Nielsen is way past the point of being able to claim any deniability for what the agents under her are doing to these immigrant kids, and for that matter she’s past the point of being able to claim she’s not legally culpable. 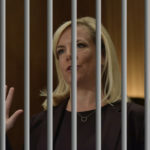 We all know the order went from Donald Trump to Nielsen on down the chain, but even if that part can’t be proven, Nielsen has spent the past several months seeing hard evidence reported by the media about what’s going on in her camps. She knows kids are in cages. She knows multiple kids have died. So how is she responding to it? The idiot just admitted that she knows precisely how badly these kids are being abused, by her agents, under her watch. She clearly has no intention of doing anything to try to stop it, which makes her criminally liable for every one of these child kidnappings. She’ll go to hell for it in the end, of course. But in order to make sure no one in the U.S. government ever tries to commit these kinds of atrocities again, Nielsen needs to go to prison first.